Scrap Attack quilt top finished! Well, it looks like my worries about not finishing in time for Monday’s deadline were unfounded. I finished the top of my scrap quilt just now. The fabric is almost entirely scraps from the Nine-Patch quilt. I had three central squares worth of strips, and pieced the fourth central square out of the edges and scraps from making the other squares. The greys all came from a scrap pack from FabricWorm, which I’m glad I impulse ordered a few weeks ago: without it I would have had a much harder time making anything even remotely quilt-sized. 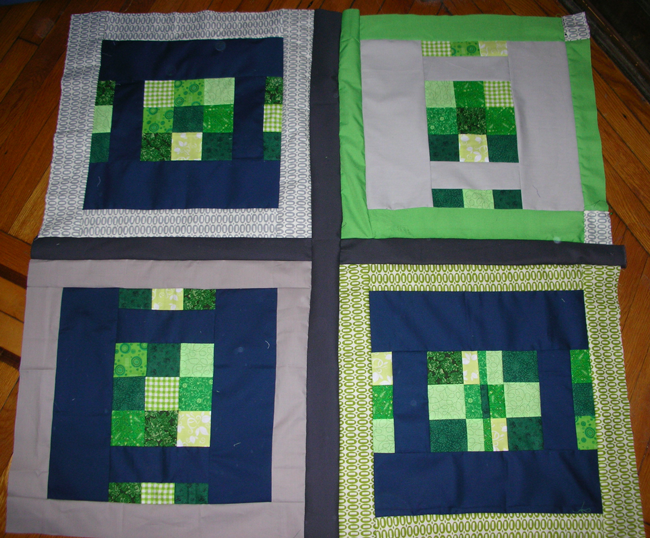 The only things I pulled from my fabric stash are the charcoal sashing and the green pezzy prints for one border. It’s about 45×45″ though I imagine it’ll lose a tiny bit of size when it’s quilted. I’m planning to bind it in the same charcoal that I used for sashing. I honestly have no idea what I’m going to use for a backing, but I suppose I have time to figure that out. Next Next post: I guess it’s not called frogging when you quilt, huh?